Sept 26 42, Wood for tables and chairs : Japanese Relocation Center, Heart Mountain, Wyo. 1 painting mounted on paper : watercolor ; 9 x 12 in., paper support 9.75 x 12.75 in. Watercolor in hues of brown, yellow, blue, purple, and gray of people picking through a lumber pile looking for wood to make furniture. Two men in foreground, center right, carry lumber away from pile. 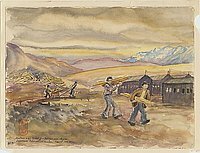 At midground, one figure pulls a wagon full of lumber while another person pushes from behind toward four barracks on right side. One figure stands amid lumber pile in background left. Multihued mountains in background ; blue and white mountains visible on right. Brown hued sky. Written in black ink below red hanko (personal mark, consists of two characters that translate as "Ishigo"), bottom left corner: Sept 26, 42, Wood For Tables and Chairs / Japanese Relocation Center, Heart Mt. Wyo. Written in pencil, bottom left corner: #10.